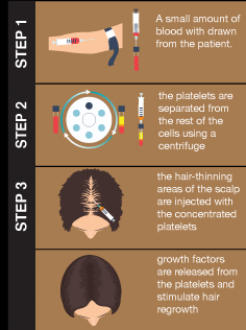 Platelet Rich Plasma (PRP) treatments have become well established in the medical community as a safe and effective way to revive dormant hair follicles. Plateletes are specialized cells in your blood that are well known to produce several important growth factors. PRP treatments involve the drawing the patients own blood (similar to a simple lab blood draw), centrifuging the blood to separate the platelets from the other blood componenents, and then re-injecting the high concentration of platelets back into the desired area of treatment (scalp for hair loss, facial skin for fine lines and wrinkles). Upon injection, the platelets are activated to release at least eight essential growth factors to help to revive dormant hair follicles (if used in hair restoration) or stimulate collagen production (if used in skin rejuvenation). Most patients will require 3-4 treatments spaced-out about 6 wks apart. Afterwards maintenance treatments are recommended 1-2 times a year. Typically takes 3-6 months to start seeing results. However, some patients may not see noticeable results for 6-12 months. Because we are using the patient's own blood products (autologous transplant), there is very little risk of adverse effects other than rare chance of skin infection (with any procedure that uses needles), bruising, and temporary tenderness at the site of injections. Call 517-336-1200 to schedule your consultation visit. We look forward to seeing you in the near future! Would you like a member of our staff to contact you for a consultation for PRP Hair Restoration?